U.S. stocks ended with small gains last Friday, slightly paring a three-day slide to finish a volatile week lower amid North Korean threatened missile attacks and reprisal warnings by President Trump. However, Friday’s return to relative calm was not enough to undo market damage from the geopolitical rhetorical furor, with the Dow Industrials and S&P 500 experiencing their worst weekly declines since March. Following North Korea’s threat to strike Guam, the VIX Volatility spiked by 56% during the week, with 44% of the rise occurring on Thursday. Tensions eased on Friday, after China issued a stark warning to Kim Jung Un that if North Korea initiates or threatens hostilities against the U.S. with first-launch missiles, China would remain neutral and offer no military assistance, come what may, in reprisals by the United States. Yet the warning was double-edged in that China stated that it would intervene if the U.S. strikes first. European and Chinese equity markets also broadly retreated, with the Stoxx Europe 600 down 2.59% and the Shanghai Composite fell 1.61%. The MSCI All-Country World Index lost 1.53%. For the week, the S&P 500 fell -1.37%, the Dow Industrials declined -1.06% and the MSCI EAFE (developed international) sank -1.48%. Economic growth across the globe has started to pick up speed, as evidenced by the global manufacturing purchasing manager’s index (PMI) hovering near a six-year high. For its part too, the U.S. economy is still slowly picking up steam, but the greatest acceleration in growth is happening in other developed and emerging market countries. Some investors wonder whether the best way to access this improving global growth story is via U.S. companies with a large percentage of revenues coming from abroad, rather than by taking direct equity exposure outside the U.S. While U.S. sectors with large foreign exposure, such as technology, have indeed started to benefit from the improving global backdrop and the weaker-trending U.S. dollar, investors should not forget that there is a diversification benefit from investing directly in international markets as well. As Chart 1 shows, the correlation between U.S. and international stocks has been decreasing significantly since the 2008 global financial crisis. This means, according to J.P. Morgan, that individual markets are increasingly moving based on local, rather than global, factors. 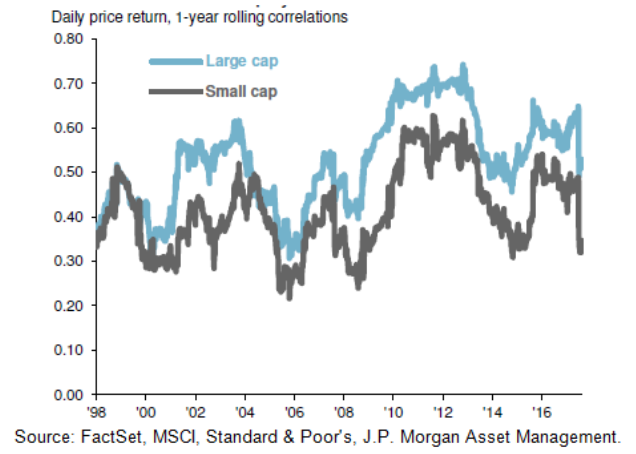 This is particularly true when comparing the correlation between small cap U.S. and international companies. With an improving economic backdrop in other parts of the world supported primarily by improving domestic demand, investors should consider whether their portfolios have direct exposure to this aspect via both large and small cap international stocks.